For my birthday this past year, my dear hubby took me to a trendy bar/eatery. The highlight was my drink. So I have carefully crafted my own improved version for home consumption. I used a hurricane glass because it made it prettier. As you know, a good part of the appeal of food and drinks are the appearance. Make it pretty and taste good., and you will wow your friends. I have intentionally made this drink with and without alcohol, for one, because I am such a lightweight drinker! Without vodka, it was still fantastic! I can also share the mocktail version with the kids. I like my drink with the extra sweetness of vanilla syrup. If you are trying to cut calories, you might want to back off the regular syrup and switch to sugar-free and consider fat-free half & half. I know fat-free half & half is a mysterious chemical alteration of the real thing. But if you want that texture and creaminess, it's an option. By the way, a regular shot is in the US is 1.5 ounces. I used 2 ounces (or 1/4 cup, or about 44 mL) of vodka because hurricane glasses are big. 1. Combine vodka, 1/2 and 1/2, OJ, and vanilla syrup in a tall glass. Stir well to mix. 2. Add soda and stir gently. Add ice gently to fill the glass. Leave some space at the top. 3. 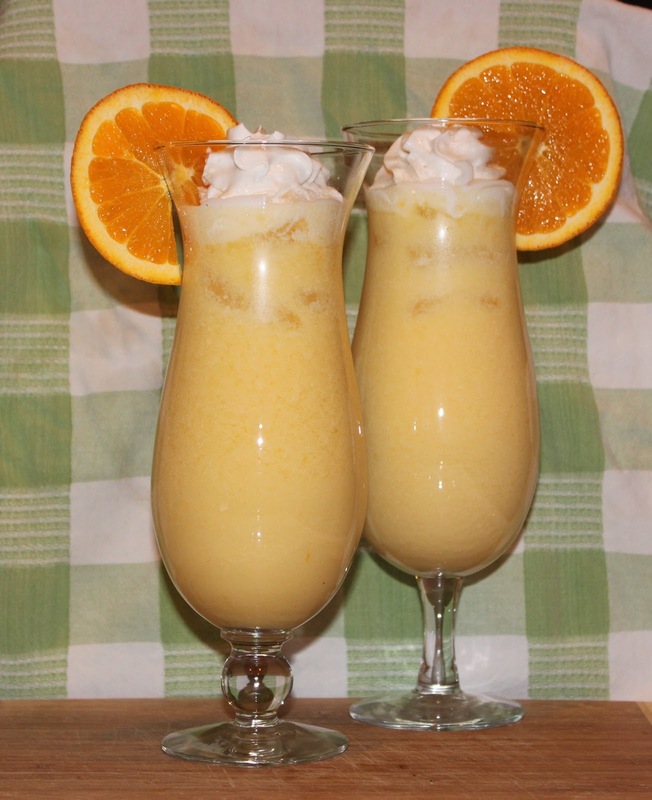 Serve with a dollop of sweet whipped cream on top and a sliced orange on the rim of the glass. 1. Combine 1/2 and 1/2, OJ, and vanilla syrup in a tall glass. Stir well to mix. 2. Add soda and stir gently. Add ice gently to fill the glass.